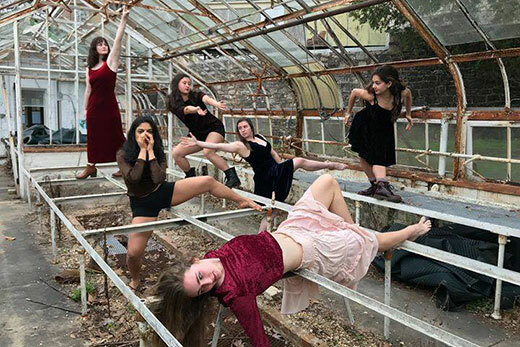 This month's calendar includes spring recitals from several Emory arts groups, including the Emory Dance Company performing "What Once Was," featuring work from seven student choreographers. Arts events are in full bloom on Emory’s campus this April. The Spring 2017 David Goldwasser Series in Religion and Arts features a traditional Wayang Kulit performance and The Art Sermon: A Lecture by Theaster Gates. Also on tap for this month are Theater Emory’s "Ravished," Emory Dance Company’s student-choreographed concert, and perennial family favorites like the Pajama Concert and Musical Animals. Theater Emory’s production "Ravished" continues through April 9. Conceived and directed by Emory Alumnae Ariel Fristoe and Maia Knispel, the show is described as “A Midsummer Night’s Dream” meets Armageddon. The Emory Film and Media Studies department continues their series on visiting Israeli filmmaker Nitzan Gilady with screenings of his works "Jerusalem is Proud to Present" (2007) on Wednesday, April 5, and "Family time" (2012) on Wednesday, April 12. Each screening will be followed by a Q & A session with the artist. Bring the whole family to the Pajama Concert on Friday, April 7, featuring musical nighttime stories performed by the Vega String Quartet, and hot chocolate of course. Later in the month, catch the musical tale of Ferdinand the Bull and Peter and the Wolf at Musical Animals on Sunday, April 23. Emory’s Music Department ensembles host a number of spring recitals this month, including the Emory Chamber Ensembles on Sunday, April 9; Emory University Chorus and Emory University Symphony Orchestra together in concert on Friday, April 14; Spring Jazz Concert on Tuesday, April 18; the Argentine Tango Concert on Wednesday, April 19; the Emory Wind Ensemble on Friday, April 21; Stageworks 2017 on Saturday, April 22; and Emory Concert Choir on Sunday, April 23. Didn't get enough jazz the first time around? No fear, catch Jazz on the Green on Thursday, April 20. Pulitzer Prize-winning author Junot Diaz delivers the 2017 Goodrich C. White Lecture on Wednesday, April 12. A week later, hear the best literary voices Emory has to offer as winners of the Creative Writing Program and English Department student writing contests present readings of their work at the 2017 Awards Night, set for Wednesday, April 19. On Thursday, April 13, Plays Well With Others, the David Heath Lecture in Modern and Contemporary Art, features speaker Daniel D’Oca, co-founder of Interboro Partners and Associate Professor in Practice at the Harvard School of Design. D’Oca discusses how Interboro’s work strives to be populist, pluralist and rooted in the realities of everyday life. Emory Dance Company presents its spring concert, “What Once Was,” from Thursday, April 13, through Saturday, April 15. The concert features new work by seven student choreographers.